Feeling bad about your daily Starbucks fix? Don't. While it's true that all those $4 lattes could, in theory, buy you a used Mercedes to drive to the nursing home in 50 years, a noted consumer expert advises that it's the big things -- not that little ones -- that can make a really significant difference in your finances. 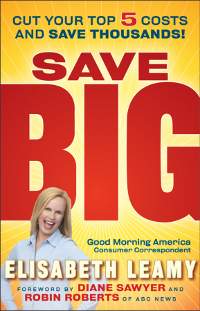 Elisabeth Leamy, Good Morning America's consumer correspondent, can recite the usual advice from memory: "Switch to low-flow showerheads, save $5. Inflate your tires properly, save $9. Use your own banks ATM, save $3. Pack your lunch, save $7." But that doesn't mean she agrees with it. "I don't believe in penny pinching," says Leamy. "I like to pinch $1,000 bills." And Leamy says her new book -- SAVE BIG (Wiley; January 2010; $24.95; Hardcover) -- will do just that. Leamy estimates that consumers who follow her advice can save up to $1,176,916. • Fight junk closing costs when you buy a home and save $2,530. • Refinance into a shorter mortgage. Save $103,536. • Appeal your property taxes and save $1,265 a year. • Buy a dark horse car instead of the most popular make and model and save $ 6,814. • Pay cash for your car and save $2,608. • Exercise a secret warranty where the dealer fixes flaws for free and save $1,400. • Ferociously guard your credit score and save $2,916 a year on your mortgage. • Undergo rapid rescoring before finalizing a mortgage and save $72,000 over the life of the loan. • Negotiate for a lower credit card interest rate and save $1,272. • Price match using simple online tools and save $4,628 a year on groceries. • Stockpile and save $5,772 a year on groceries. • Master creative couponing (Click dont clip!) and save $7,956 a year. • Raise your health insurance deductible and save $2,700 a year. • Take the over-the-counter version of a drug instead of the identical prescription version and save $1,763 a year. • Hire a medical billing advocate to fight hospital billing errors and save $6,858. A recent Consumer Reports poll showed Americans have responded to the recession by ushering in a new era of intelligent thrift; 79% of respondents said they will continue to purchase only what they truly need post-recovery. Two-thirds said that if they were to win $10,000 they would use it to pay down debt or build their savings. Leamy thinks her book will resonate with an audience hungry for a new strategy that's built around significant savings. Even better, says Leamy, is that many of her cost-saving tactics don't require sacrificing time and energy on a daily basis. "Save big (not small) and I think you will find that you save something even more precious than money: time. The puny savings ideas other authors tout take a lot of time. They need constant maintenance. They require willpower," she said. "In the face of a zillion different daily deprivations, most people fail. I find it much easier to channel my energy into a few big cost-savers that I only have to tackle every once in awhile. direction. Leamy, who assures us she has no connection with upscale coffee purveyors, appears on Good Morning America several times a week, digging up new ways to save money, alerting people to dangerous products and giving a heads up about scams and rip-offs. Leamy also reports for World News, Nightline and 20/20 and writes a weekly column for ABCNews.com. Her first book, The Savvy Consumer, was published in 2004.